We recently had a need to replace some windows in our house. Over time, the hot and the cold of Oklahoma had caused our windows to expand and contract to the point that several of them had broken — inviting unwanted 6 and 8 legged “friends” to join us in our humble abode. We decided to replace these broken windows . . . but what would we replace them with? Like so many areas of life, there is a whole world of options that sit behind seemingly simple decision. Should the windows be made of plastic, wood, or a hybrid? Did we want grids in the windows? Would we like the windows to open? And if so, how did we want to open them? What color should they be? And on, and on. I know, I know . . . these are first world problems, and a blessing to be able to HAVE options for ANY window . . . much less windows that we liked . . . but the decisions still had to be made. Though each window had its own unique contribution to bring, they all had a few things in common — including the glass that filled the frame for us to peer through. I was thinking about this today as I read through Romans 12:9-13. In Romans 12, Paul has just been talking about all the “options” that make Christians different from each other — a difference that is by design. Some of us have gifts of speaking, while others have gifts of serving. However, despite our differences in WHAT we do when we serve, there is an incredible similarity in HOW we should do our WHAT in service. We are to have service that is characterized by love. Paul makes this clear everywhere he talks about spiritual gifts. He did so in 1 Corinthians 12 (where he talked about gifts) and 13 (where he talked about love), and here in Romans 12:3-8 (where he talks about gifts) and 12:9-13 (where he talks about love). When people peer through the life of a Christian (regardless of their gifting) they should see the agape love of Christ. 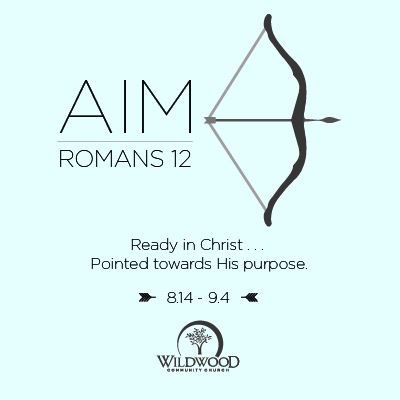 This Sunday at Wildwood Community Church, we will continue our series called “Aim” by looking at Romans 12:9-13 together as we see the love we should be aiming at in our Christian lives. Join us in our 8:30, 9:45, or 11:00 service as we worship Jesus together, continue our sermon series, and partake of the Lord’s Supper. See you Sunday . . . and bring a friend!